Plat Únic wildest dish just arrived! Spring begins and this, in Plat Únic, can only mean one thing … we are rolling out a new dish! After having waved goodbye to winter with our very own Fricandó, we welcome in the new season with a new proposal: the veal shank! 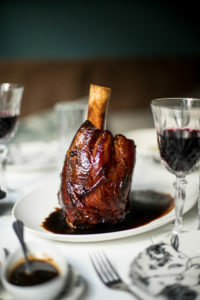 This time, we go back to the Viking era with our suckling veal shank cooked at low temperature and coated, with great patience and care. But the shank doesn´t come alone, it comes accompanied by three seasonal garnishes and two sauces so that you can combine it just the way you like it. 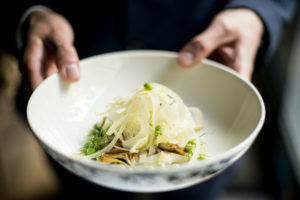 A seasonal vegetable dish made with artichokes and fennel and peas with lemon vinaigrette. 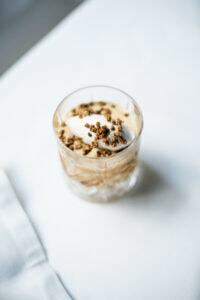 A very cabbage rich salad (red and green) with raifort (horseradish and sour cream). And third, but no less important, the potato parmentier of the house, a classic Plat Únic dish. 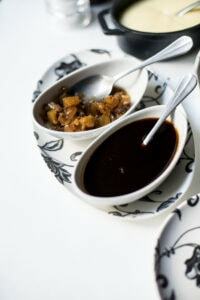 Furthermore, you can “soak” the meat with two sauces: veal sauce and pineapple chutney, a pineapple marmalade prepared with vinegar. If you´re still left wanting more, and we recommend that you leave room for the end, we have a dessert that won´t leave you ambivalent! As we like to go beyond the obvious, we decided to revise the traditional whiskey cake and bring you a very updated proposal: served in a glass of whiskey! To complete this Viking experience, we propose an activity to get rid of all the accumulated stress: axe throwing! 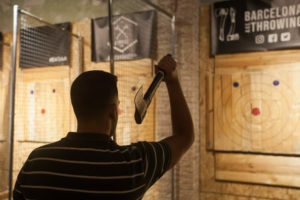 We have joined up with our neighbors Barcelona Axe Throwing to offer you a unique and original experience. Enjoy throwing the axes (against a bull’s-eye, of course! ), and upon finishing, cross the street and come and try our Veal Shank in Plat Únic. Are you up for it? We guarantee that it will be a day to remember!